Rabbit Problems Ruining Your Lawn? When it comes to lawn care nothing is more frustrating than combatting the ongoing damage done by wild rabbits. These creatures use your yard as both a buffet and a latrine to double down on the damage. 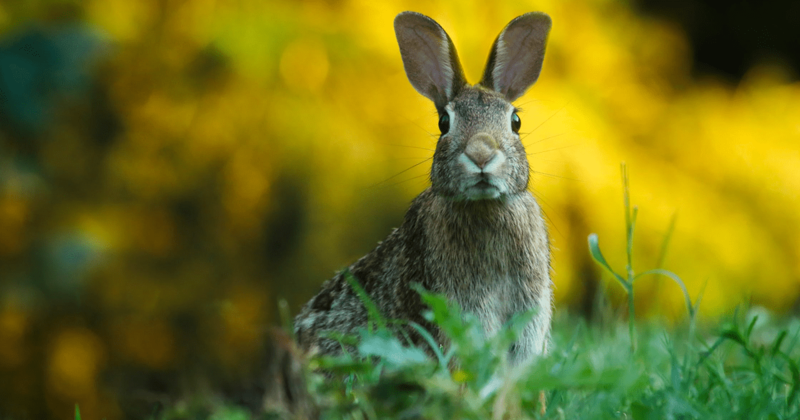 Rabbits droppings and urine can stink up your yard, your shoes, and gain the attention from domestic animals (cats and dogs) that then bring the awful odor indoors. There is no quick fix for a Rabbit problem. You have to develop a multi-phase strategy to get these squatters off your land and remain diligent in preventing them from returning. Rabbits do not give up easily, they are very smart and determined creatures. The most effective method is to block access to your yard by installing a 3’ to 4’ foot high rabbit fence, one foot of which should be buried underground. Rabbits are powerful jumpers and also can tunnel their way into your yard, under standard fencing. Bushes and plants attract rabbits. Trim low hanging branches that can provide shelter and hiding spots around trees shrubs, and bushes. You can also use fertilizer containing blood or bone meal in gardens and plant beds to repel herbivores like rabbits. Some suggest using other repellents like cayenne pepper, human or pet hair, kitty litter, coffee grounds, and manure. But these are not as successful as a strong barrier and some of these applications can be harmful to desirable insects, birds, and pets. Gated entryways into the yard are often overlooked when installing a rabbit barrier. Be sure gates leave very little wiggle room underneath or around fence posts. Before we hydroseed, we suggest homeowners take the extra step before planting to install perimeter rabbit fencing to prevent rabbit problems. Many skip the step as they have not seen rabbits on the site. But once the grass is green and appealing to the furry creatures, it isn’t long before the destruction is evident. You can repair damaged rabbit areas by overseeding and by patching and seeding large bald areas once you have properly blocked yard access. Hydroseeding offers many benefits compared to sod and costs just pennies on the dollar in comparison. We are Canyon Hydroseeding servicing customers in Southern California for over 30 years. Click here to learn more.